It feels like writer Tom Taylor has less set-up to do in the second volume of Injustice: Gods Among Us, especially in terms of the tragic deaths that catalyze the piece, and this allows for more of your standard superhero fare for the reader to get behind. Injustice is the pro wrestling of the DC Comics set right now (appropriate for a comic based on a fighting video game), a book enjoyable largely in how over-the-top and "wrong" it often is. Taylor writes a convincing Superman vs. Batman story here; this is not "our" Superman and Batman, nor would we ever want them to be, but I found this a credible take on what a conflict between these two heroes might be like. There's a few sequences in Injustice Vol. 2 where Superman and Batman work to one-up one another. Batman kidnaps one of Superman's allies and replaces them with a spy; Superman attempts to reveal to the world Batman's identity; Batman brings the Justice League watchtower crashing to Earth. If we turn our heads and squint a little bit, and tell ourselves this is not the shining Man of Tomorrow and the noble Dark Knight, there's something engaging about this conflict of brawn versus brains, each of them convinced of their role as the hero of the story. Taylor nicely complicates the conflict, as when Batman and his team break into the Fortress of Solitude wanting to steal Superman's secret weapon, but their efforts are misconstrued as trying to harm Superman's parents. At the (cold, cold) heart of the book, each hero wants desperately for the other to understand their point of view; this could be written as just a story of Bright Hero A versus Dark Hero B, but the layers of past friendship that the reader brings to a tale of Superman and Batman give their conflict extra depth. Much of the plot of Injustice Vol. 2 turns on that secret weapon, a "magic pill" created by Lex Luthor (Superman's buddy, apparently) to give normal people super-powers to help Superman fight his war on crime. I don't know to what extent the magic pill corresponds to the Injustice video game, but I can extrapolate a certain logic here -- Black Canary can't reasonably go up against Superman in the game, but by fiat of a magic pill (no less ridiculous than any other solution), those match-ups become feasible. I haven't played Injustice, but I sense Taylor gets closest to a real approximation of the gameplay in the annual collected here in which a powered-up Harley Quinn fights Lobo. That's a ridiculous match, but then again putting Harley and Lobo together in a story makes a certain amount of sense, and herein one begins to see Injustice's appeal -- no rules also means no limits to the storytelling. What's to the benefit to the story, of course, can also be its drawback. That Taylor portrays, in another instance, Ma Kent, Pa Kent, and a hologram of Jor-El all hugging over their concern about Superman is a wildly imaginative scene, and exactly the kind of thing you might never see anywhere else that Injustice should strive for. On the flip side, however, is one of the concluding scenes where Superman breaks Batman's back over his knee Bane-style, simultaneously horrifying and ridiculous, which might be pegged as appropriately over-the-top or gruesomely irreverent, depending on your point of view. And not to be outdone, Taylor finishes the book with a sequence where a super-powered Alfred (yes, Alfred) punches and kicks and head-butts Superman to a pulp. Again, there's something fantastically outrageous and also very, very wrong with the story here. What generally sells me on a "wrong" story of this type (Judd Winick's Catwoman Vol. 1: The Game is another that comes to mind) is whether it's apparent to me that the authors understand the kind of story they're telling. It's fitting that the book starts with a Shazam (nee Captain Marvel) story in which Billy Batson interviews people about their perspectives on Superman's dictatorial ways, ending with a pseudo-conversation between Billy and Shazam/Marvel himself. Billy remarks, "I don't think someone as young as me is supposed to see this stuff ... I think it's affecting me." Taylor, in essence, gives the book a warning label; this is rough stuff, by design, but it's not blithe about it (Alfred bashing in Superman's face notwithstanding). Injustice ought end the debate (though it probably won't) as to whether superheroes should kill. Taylor brings Apokoliptian blowhard Kalibak to Earth, raining down destruction with his Parademons, even as he chides Superman that he knows Superman won't kill to stop them (setting aside that, at least in the New 52, Parademons are robots). We see here quite clearly the slippery slope; Superman does not want to kill, but having already killed the Joker, murder as a viable solution becomes easier and easier, and Superman indeed kills the Parademons. A little while later, Taylor offers a scene in which Superman and the Flash play chess, and Superman proposes destroying all guns; here, Flash demonstrates the slipper slope himself by asking Superman if they'd next outlaw cigarettes, or lock up people who speed in cars, or leave dangerous dogs unchained, or who don't recycle. Taylor at times makes Superman's hard-line approach in the book very attractive, but he also demonstrates its complete unworkability; there's no scenario in which Superman trying to protect people from themselves doesn't end up in a totalitarianism regime. Taylor populates the story with characters that know this, even on Superman's side, including the Kents, Jor-El, Lex Luthor, and the Flash. What I hope is that Taylor is moving us toward a place where Superman recognizes the contradictions as well; the Injustice game dictates Superman can't change his position, but I would be curious to see Taylor write Superman's dawning insight at the same time. As with many of DC Comics's digital first books, Injustice straddles the line of being kind-of, sort-of an old DC Universe book. Taylor side-steps much of that with this being an alternate universe, but in flashbacks we see that Superman used to wear his classic underwear-on-the-outside costume and Harley Quinn once wore her clown suit (I'd be pleased to see a Year Zero Injustice story at some point that depicts how the characters went from their previous appearances to these). The Fortress of Solitude here has the classic big key, and Taylor's Jor-El is the old John Byrne version; all of these are nice remembrances of times past, even in a book that for many might sully those memories. At the same time, Taylor plays fast and loose with established continuity at other times, making that call for a prequel to the prequel even stronger. Most notably, in Injustice Superman and Lex Luthor have always been friends, and Taylor treats it so matter-of-factly that the reader does a double-take; surely that's a story waiting to be told. Also, there's an amusing scene in which we find Huntress and Black Canary, but not Green Arrow, know Batman's identity. It is amusing, but it's hard to imagine the series of events through which Taylor thinks that logically would be the case. The first volume of Injustice began and ended with some really appalling deaths -- Superman murdering Lois and his child on one end, and Robin Damian Wayne killing Nightwing with an absurd trip-and-fall on the other. 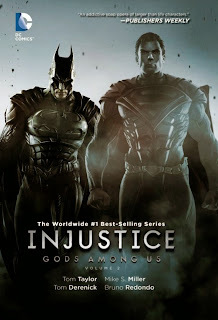 In that Injustice: Gods Among Us Vol. 2 skews less tragic, more loony, and with greater emphasis on freedom fighter Batman, I was able to enjoy the story more and feel the "wrongness" less. Injustice will not appeal to everyone, but Tom Taylor piqued my interest this time, and I'd be curious to read the first Year Two volume. is it millar on the art? No, that's Mike S. Miller. Before this book, I only knew him from his brief stint on Adventures of Superman with J.M. DeMatteis and the four JLA issues he drew during Waid's run. I think Injustice is fairly under-served, art-wise. The artists aren't to my tastes (including one whose art I've really never cared for); Kevin Maguire's brief appearance is a godsend. Given how popular this title has become, I fervently hope Year Two comes with bigger-name talent. Bruno Redondo has been on the book full time since Year Two started. But I think starting with the 7th issue (of 12), the art-team will rotate due to maybe the rushed deadlines. Year Two was mainly one print monthly and two digital chapters each month, but with the start of July, it is shifting to two prints monthly and four digital chapters. Redondo's artwork is very good, so Year Two Vol 1 will be great artwise (and storywise as well!) but not sure of Year Two Vol 2. Shouldn't have rushed getting Year Two out. It's been well served monthly so not sure why that is changing.